Can You Show Me How…? My sister-in-law, Marilyn, grew up in Colorado but now lives in Spain. She occasionally returns to visit the U.S. with her two young daughters, Carlin and Kathleen, and her Irish-Spanish husband. In July 2005, she and her family were visiting relatives in Oregon in the USA. 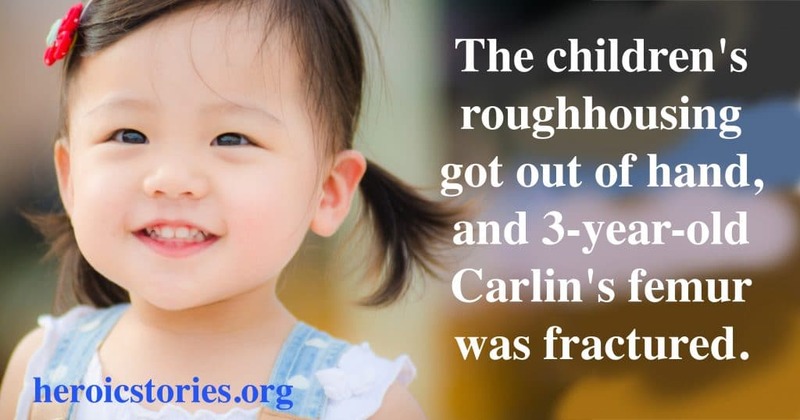 The children’s roughhousing got out of hand, and 3-year-old Carlin’s femur was fractured. X-rays at the local emergency room showed what the doctor called a “buckle fracture” on the bone above her knee. It was worse than a hairline crack, but not a bad break. He advised against a cast, which is more of a hazard than a help in that particular situation, with a very young child. He predicted the fracture would heal in 10 days to three weeks, and she’d be walking again in a month. So for a while, Carlin scooted around on her bottom, like a baby that hasn’t yet mastered a coordinated crawl. She took obvious pleasure in the extra attention. She had the air of a good-natured, legless queen. As their vacation in the US drew to a close, nearly three weeks had gone by, and Carlin still refused to walk. Marilyn decided to take Carlin back to the hospital. The doctor looked at the X-Rays and talked a bit to Carlin’s parents. Then he asked Carlin what happened. “I fractured my femur,” she said, proud to know such technical terms. “Can you walk on it?” he asked. “Sure,” Carlin said. She got up and strolled across the room. When she turned around, she wore a peculiar expression of gratification and surprise. “Now, does that really hurt?” the doctor asked. “Oh, yes,” she said, with a conspiratorial smile. But her face gave her away. “I think it’s OK for you to walk from now on,” the doctor said. So she did, and now she’s bipedal again. That gives me an idea. Maybe I could say to myself,”Can you show me how you used to walk when you could stand up straight without a cane or walker?” It might work, or at least get me started.